This book will sell across disciplines and borders. Cultural studies, women's studies, political science, anti-racist studies and Canadian studies will be the potential buyers, as well as the conscious reader in Canada, the US and the UK. The author's other books, one from Sister Vision in 1993 and one from the Women's Press in 1995, continue to sell well. These essays have appeared in various journals and readers but these have not yet appeared together in book form. Himani Bannerji has a background in English and Sociology and is an Associate Professor in the Department of Sociology at York University. She is the author and translator of several books, including poetry, fiction, and essays: Unsettling Relations, The Mirror of Class, Jagannath, Coloured Pictures, Doing time, A Separate Sky, The Writing on the Wall, The Dark Side of the Nation, and Of Property and Propriety: The Role of Gender and Class in Imperialism and Nationalism. 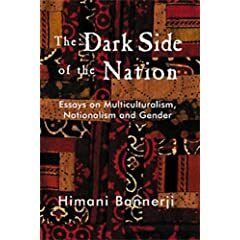 Himani Bannerji, teaches in the Department of Sociology at York University. Her research interests lie in the areas of Marxist, feminist and anti-racist theories. She is especially interested in reading colonial discourse through Marx's concept of ideology, and putting together a reflexive analysis of gender, race and class. She has co-authored and edited Unsettling Relations: The University as a Site for Feminist Struggle (The Women's Press), Returning the Gaze (SisterVision Press) and a book of essays on culture and politics, The Writing on the Wall (TSAR Press). Her new book of essays, Thinking Through: Essays in Marxism, Feminism and Anti-Racism is forthcoming from The Women's Press in Spring 1995.